Stonewall Gazette: Is Mickey Rourke going to play gay rugby hero, Gareth Thomas, in a new film bio? 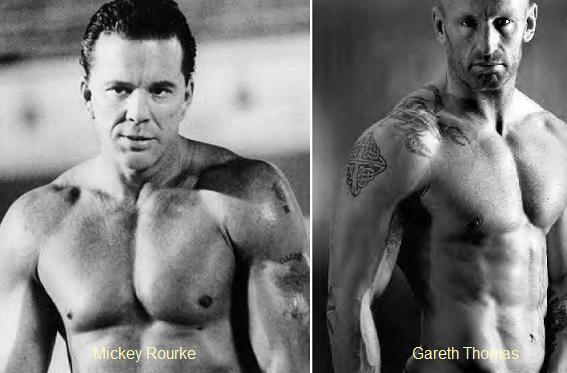 Is Mickey Rourke going to play gay rugby hero, Gareth Thomas, in a new film bio? Mickey Rourke is not the right actor to play him (too wacky). Perhaps, he can act as producer of the project. It would be great to see a bio pic about rugby star, Gareth Thomas! Their managers are now trying to work out a deal to make a movie based on the life of Wales's most-capped rugby union international. Oscar-nominated Mickey Rourke, 57 - a former boxer - is believed to have wanted to do a film about rugby for some time. But he did not have a suitable story until he read about full-back Gareth Thomas. Thomas, 35 - who last year became the first rugby union player to reveal he was gay.